A week or two ago I was sent a new meditation seat to try out. 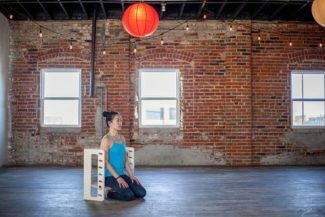 It’s the Mayu Seat, developed by Cierra and Sean McNamara of the Mayu Meditation Co-op in Denver. It’s not your typical fold-it-up-and-stick-it-under-your-arm type of meditation seat — but that’s for a reason. It can be used by people who lack the flexibility to sit in either a cross-legged or kneeling posture, and who normally rely on folding chairs, dining chairs, office chairs, and any number of barely suitable seating arrangements. It’s very attractive, being made from birch plywood. It’s not, as I’ve suggested, something you’re going to habitually carry around with you, but it does fold down if you need to throw it in the back of your car or stash it away someplace. The plus side of its weight is that it feels solid to sit on. The problem with most conventional chairs you see people using to meditate on is that they have flat seats. When you sit on a flat surface, the hips tilt back, and the spine ends up leaning against the back of the chair. This isn’t ideal for meditating, since you want to have the spine erect. Now you can adapt a regular seat to have a forward tilt by putting a wedge cushion on it or by putting blocks or books under the back legs. That works pretty well. But chairs also have the drawback that the height isn’t adjustable. People who are tall end up having to tuck their legs under the seat or have them sticking out in front of them. Both of those things affect the basic posture. Short people are left with their legs dangling or have to put their feet on a cushion. 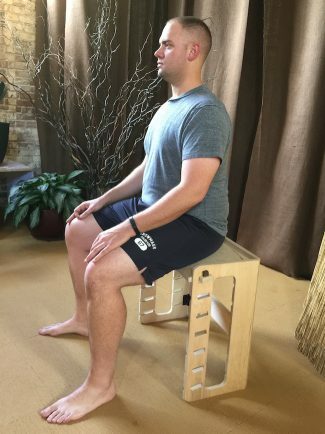 The Mayu Seat at its second-lowest setting can be used with a kneeling posture. The Mayu seat, by contrast, has a variable height, and is angled. The seat fits into precut angled slots at one of seven heights. I’m six feet, and the highest setting worked for me. Very low settings are suitable for sitting in a kneeling position, while the lowest can be used for sitting cross-legged. It’s very comfortable. I’ve even used it for working at my desk, so if you’re thinking of having one of these in your home, bear in mind that you don’t just have to use it for meditating. There’s one caveat, though, which is that the Mayu Seat doesn’t come with a cushion, and naked plywood gets pretty painful after a while. I’ve been using the KindKushion, which is non-slip. Just about any foam would work, though, as would a folded towel or blanket. Hopefully Sean and Cierra will find a suitable cushion supplier. It only takes a moment to shift the seat from one height of slot to another, which makes this seat perfect for any situation where a variety of people might want to use it — such as a meditation center. I’d go as far as to say that every meditation center should have a few Mayu Seats! At $199, it’s not an inexpensive option, but looked at as a life-time investment in meditative comfort, that’s not much at all. Many people with a committed meditation practice and a need to find effective and comfortable seating will find the Mayu Seat ideal.